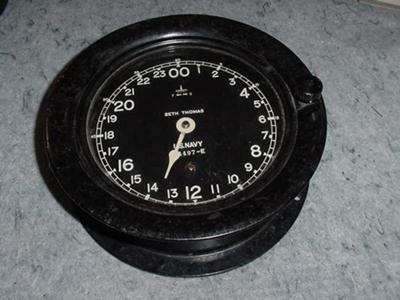 I have a Seth Thomas 24 hour navy clock in a bakelite case that needs a minute and second hand. The part inside the clock that rotates back and forth is loose as well. Can you tell me if these parts are available so I can return this clock back to normal operation. I also own the same clock and have had difficulty finding replacement parts. I have been reading in many forumns and there are hundreds of people who have these clocks which just cannot be repaired because of a lack of parts. It is easy to at least buy similar replacement hands, just as long as the clock movement works correctly. I have several resources for original parts - the escape is one of the toughest to find. Too bad there isn't a site for just Seth Thomas parts- now with the internet it could be so easy...all you need is dedicated time. You can prbable get good guidance from a clock shop that has been in business for at least 20 years. I live in Washington, DC Metro area so I have many resources. If you do decide to sell the clock if it doesn't run,let me know. Good luck, and hope all works when you get new hands. Would you consider selling your clock? I also have the same clock and it needs parts.